Comedy; 1994; 105 minutes; Color. Available from Amazon.com. TWM offers the following movie worksheets to keep students’ minds on the film and to focus their attention on the lessons to be learned from the movie. Worksheet for Cinematic and Theatrical Elements and Their Effects. Teachers can modify the worksheets to fit the needs of each class. Roger, approximately ten years of age, is made a ward of the state and placed in a foster home. Apparently, his mother has died and his father suffers from immaturity so severe that it prevents him from wanting to raise his son. But Roger, as most kids would be, is desperate to be reunited with his dad. In a cynical joke, Roger’s father promises that if the California Angels (at that time perennially in last place in their division) win the pennant, he will come back and claim Roger. The child then prays that the Angels will win the pennant. Suddenly angels appear from heaven to help the team. In the end, Roger finds a home and a father, although neither are what he expected. Featured Actors: Danny Glover, Tony Danza, Christopher Lloyd, Brenda Fricker, Ben Johnson, Joseph Gordon-Levitt, Jay O. Sanders. This film will acquaint children with the foster care system and show adult characters who are nurturing. Other adult characters, not mature at the beginning of the film, grow so that they can undertake the responsibilities of a parent. They are contrasted with Roger’s father, who is too immature to nurture anyone. “Angels in the Outfield” also shows parenting relationships crossing racial lines and the beauty of friendship and loyalty. 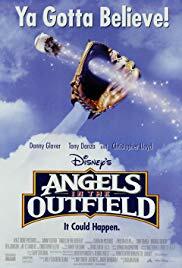 Children love “Angels in the Outfield.” Critics have justifiably called this film “a flimsy exercise in feel-good sentimentality so strained it suggests that even God scans the box scores.” (Hal Hinson, Washington Post, July 15, 1994.) This film should be shown to children old enough to know that God does not scan the box scores. A certain amount of feel-good sentimentality is good for people, especially children. MINOR. Mild profanity is used in this film. Some of the humor is at the expense of others. Explain to very young children that angels don’t really come from heaven to help professional sports teams. Immediately after the movie, or at odd times over the next week (for example at the dinner table or in the car on the way to school), bring up some of the Discussion Questions, starting with the Quick Discussion Question. Don’t worry if you can only get through a few questions. Just taking the film seriously and discussing it is the key. When parents cannot take care their child or abuse, the child, the state government will remove the child from the parents’ home and send him or her to live with foster parents. The vast majority of foster parents, like Ms. Nelson, provide good and loving homes for children. Parents have a constitutional right to raise their children in the way that they see fit. This right can be taken away only if the child suffers seriously from neglect or abuse and if a court determines that it is in the best interests of the child. Each state has procedures by which parental rights may be terminated. A parent can waive his or her rights as did Roger’s father or else the court, in a contested trial, can decide that neglect or abuse has occurred and is likely to occur in the future. Unless the parent agrees to the termination of those rights, due process of law requires a hearing with the parent represented by an attorney before a decision is made. Often children are taken from parents only temporarily, for example until the parents can take parenting classes, or until the parent can be treated for alcoholism, drug abuse or mental health problems. Once the parents have satisfied the social workers and the judge that they will not harm the child, the child will be returned. On some occasions, when the foster care placement has been long and the biological parents have lost touch with the child, the foster parents will permanently adopt the foster child. There are frequently long delays in court proceedings, including proceedings relating to juveniles. 1. See Discussion Questions for Use With any Film that is a Work of Fiction. While parents have the responsibility and the right to care for their children, the ultimate guarantor of the safety of children is in the community acting through the state. Our society has always recognized the responsibility and power of the state to take children from parents when the parents are neglectful or abusive. This power should be exercised sparingly and a court that hears a petition by the state to take a child from his or her parents must strike a balance between the rights of the parents to raise their children and the best interests of the child. 1. Do you think Roger will miss his biological father after living happily for a year with his new adoptive dad? Should he? Yes. Eventually, hopefully, Roger will learn to forgive his father. 2. Many adopted children try to find their biological parents after they grow up. If you were adopted, would you want to do this? Why? There is no one correct answer to this question. 3. What was the most important act of friendship in this film? 4. Do you agree that the foster mother was a female role model? Yes. She cares for and nurtures the children placed in her home. 5. How does this film show the benefits to society of a good foster mother? When homes are so dysfunctional that children are taken from the home and when children are separated from their parents, they are usually hurt and in need of love. This foster mother gave the children entrusted to her a stable and loving environment in which they could heal and start to grow again. Discussion Questions Relating to Ethical Issues will facilitate the use of this film to teach ethical principles and critical viewing. Additional questions are set out below. 1. Analyze the actions of any major character in the film applying two tests which any ethical action must pass: (1) reversibility (Would the person taking the action want to be treated the same way?) and (2) universality (Would the person taking the action want all persons to act the same way in a similar situation?). 2. Explain the role of caring as a transforming power as shown in this film? Who did it transform and how? Taking care of the boys transformed the manager into a tough-talking guy who didn’t appear to care for anyone, into a nurturing parent. 3. What would have happened to the children in this film if no one had cared? Children who are not loved have a very hard time in life. See Assignments, Projects, and Activities for Use With any Film that is a Work of Fiction. A book about the more serious side of being parentless that is suitable for good readers in junior high and middle school is They Cage Animals at Night, by Jennings Burch. A boy’s experiences in a foster home are described in pages 39 – 48. Other books about homeless and orphaned children recommended for that age group include: The Lottery Rose, A Shine of Rainbows, by Lillian Beckwith, Fostercare by Nancy Millichap Davies, and Find a Safe Place by Alex Lazzarino. Of course, David Copperfield, Oliver Twist and Great Expectations by Dickens are good for older children to read. This Learning Guide was last updated on July 18, 2011. Did Roger’s father do the right thing by giving him up? There is no one correct answer. The father should have grown up and met his responsibilities to his son. But if the father was not going to act like a mature human being, then the best thing to do was to give him up.